Improving patient management is the goal of all physicians and this 5th edition of the American Medical Association’s standard guide is designed to help you achieve that end. The highly regarded 4th edition has been fully reconsidered to produce a sound basis in the 5th edition to guide practitioners in developing quality evaluations in an approved uniform way to evaluate, measure and report impairment. 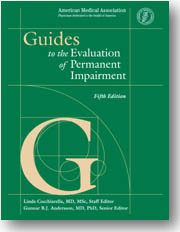 Prepared by experts in the social and medical fields, and organized to facilitate best practice and understanding of both the various body systems and the multiplicity of issues facing the treating practitioner, this volume will prove the basic resource in in the evaluation of permanent impairment.